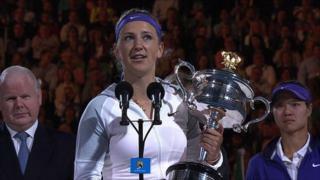 Victoria Azarenka tells the crowd at the Rod Laver Arena she will retain "special memories" of the venue after claiming her second successive Australian Open title. The Belarusian defeated China's Li Na 4-6 6-4 6-3 in an emotional and dramatic match interrupted by two injuries to Li, and a fireworks display to celebrate Australia Day. Azarenka's second Grand Slam win sees her retain her place at the top of the ATP world rankings.